A refreshing salad full of healthy nutrients. Moong dal is nutritious and a rich source of protein and calcium. Ideal for a light lunch or as an evening snack. 1. Chop the onion, tomatoes and cucumber. 2. Transfer them to a bowl with grated carrot. 3. Add the sprouted moong, lemon juice, corianer leaves and mix well. 4. Add salt and pepper powder as required. 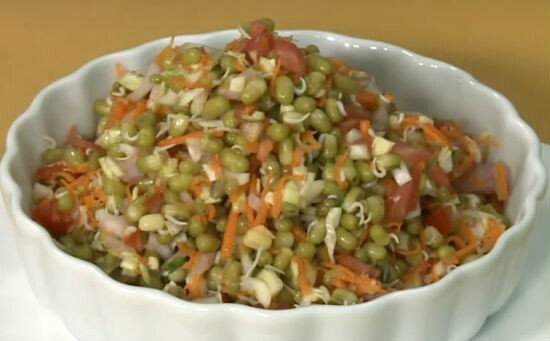 Feel free to comment or share your thoughts on this Sprouted Moong Salad Recipe from Awesome Cuisine.